A few people have asked me about Romanian Point Lace so I thought I would post a tutorial. I taught myself last year from a January 1990 issue of an "Anna" magazine and a Sept 2004 issue of "Embroidery Canada" magazine. This tutorial is how I do Romanian Point Lace, I don't claim to be an expert. I am offering this pattern I designed as a way to give people a "taste" of RPL. Romanian Point Lace consists of a crotchet braid that is tacked to a pattern and then embellished with needle embroidery. All the work is done on the back of the piece. Click on the pictures to enlarge and see detail. Not many supplies are required, you probably have them at home already. I use #10 crotchet cotton. Size 1 crotchet hook (small hook - whatever size you have will probably do). A scrap of plain cotton (I use an old plain sheet) for the pattern. Small piece of clear "Mac Tac" (some sort of sticky backed plastic) to cover the pattern so you don't stitch to the pattern. Not every one uses this, but it makes it easier and also makes the pattern stiffer. Contrasting sewing thread to tack the braid to the pattern. Fine sharp needle (and thimble) for tacking the braid to the pattern. Blunt (tapestry) needle for doing the needle embroidery. Romanian Point Lace starts with a crotchet braid. They key to this simple braid is to turn the braid after every stitch (really 2 stitches - sorry I am self taught and don't know the technical terms!). The braid is ready to be turned (always turn the braid the same way, clock wise if looking from the top). This results in a braid that is the same on both sides, with little loops on the side and bars across the braid (from turning the braid). When making a long braid it is helpful to tie the braid up with an elastic. A pin in the loop at the working end is useful so the braid doesn't unravel when you put it down. You will need about 81cm/32" of braid for this ornament. Now you are ready to work on the pattern. Trace the pattern on a piece of plain fabric (I use a ball point pen). Cover with clear "Mac Tac". Starting at an overlapping join on the pattern (this will hide the join), tack the braid (starting with the beginning end of the braid) to the pattern with the contrasting sewing thread and a fine sharp needle. Secure the start of the sewing thread by taking a few stitches at the back of the pattern. I tack the braid by coming up in between the bars on the braid, then going down beside the braid on one side and then the other. Take care not to stitch through the bars and also don't tack on the side where there will be an adjoining braid. Also pay attention to the way the overlap/under laps are on the pattern when tacking it down. On the pattern there are also spiderweb designs. Add a little stitch at the center of these designs (4) with the sewing thread (I switched to red thread so that it would show up). The back of the work, the braid is all tacked down. When you reach the end of the work (this is what I meant by starting at an overlapping join on the pattern), unravel (or add more stitches)the braid so the two ends will meet. Cut the crotchet cotton so that there is a long tail, thread on a blunt needle and make a stitch through the loop(s) at the end of the braid. Stitch the ends together and to the underlying braid. All the overlaps and joins need to be stitched together. Travel from one section to another by going under the bars. Remember that this is the back of the piece. Join the braid using the loops on the side. Now the piece is ready to have the decorative needle embroidery added. There are many options. This is how I choose to do the stitching. Like anything you make you can change it to suit your taste. Anchor the starts and stops of thread in the bars of the braid (also why I leave long tails on the braid so it is ready to be used). Make sure not to make any stitches through the pattern (it is only temporary and will be removed). Use the blunt/tapestry needle for all this work. Use the loops at the side of the braid when stitching. Make sure you have an extra long piece of cotton threaded when you start this design. Stitch 12 pairs of threads around the arch. All coming from the center and evenly spaced around the top (I use every second loop). There should be 6 on each side of the center. Once the thread has been anchored at the bottom, start needle weaving under and over 2 sets of bars. The first section is almost finished. Keep pushing the weaving down to make it even. Evenly weave 12, then 10 (8,6,4 then 2) pairs of bars to fill in the leaf shape. Always weaving under and over two pairs of bars. Coming from the side, stitch under the tacking thread. Repeat for the all the spider web bars. All the bars are in place. Ready to start wrapping the bars (I am right handed and work this direction). continue up the space in the herring bone stitch. When you reach the top, stitch in the center loop. work a feather stitch down the shape. Like the other spider web, lay the bars under the tacking thread. Wrap 4 of the bars. this is different from the other spider web variation. All the stitching is finished! Clip the tacking threads and remove from the pattern, flip the piece over to see the final results! 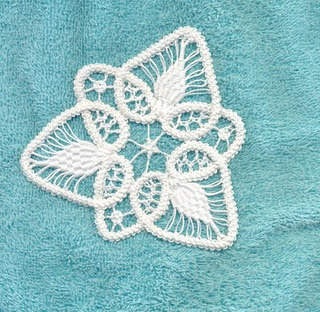 Wash in hot water and block (you can iron from the back on a towel) the ornament (it will shrink slightly and become firmer). I hope you give Romanian Point Lace a try. It is really very simple (maybe not from my instructions!). There are other ways to make the braid. These are the two types of braid that I need for the table center that I am working on (the top one is the regular braid, the bottom one will be the decorative outer edge). You Tube has some videos for Romanian Point Lace (not in English, but it will give you some ideas). There is a Flickr group for Romanian Point Lace too. Elena seems to be a real expert on RPL. There are also some books out there, I can't comment on them as I haven't actually seen them. It is easy to draw out patterns and you can also try using Batten-burg Lace patterns. 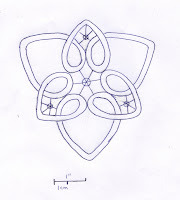 *Sept. 22nd, 2010 Update* -here is the pattern for the decorative outer edge braid. *Dec 3rd, 2011 Update* - Ravelry has become a great resource for RPL. Good luck and let me know if you give it a try (or if you need any help). Remember copyright laws - don't sell or claim this pattern as your own, do not use it or items made with it for commercial purposes, or post the pattern or my pictures elsewhere. Thanks! Crazy beautiful. I'm not ready for that in my life right now, but maybe someday if my eyes and hands hold out. This is really interesting, Joanne. I thoroughly enjoyed reading through the method. I used to do a lot of crocheting and love how it looks, but have never tried this. Beautiful! Thanks for the tutorial! I'll be trying this out soon, as soon as a few other projects with deadlines are taken care of. wow that is intense. Looks amazing. I love to try to teach myself new skills, and have usually succeeded. This art always looked quite complicated. You made it look possible. Joanne that is gorgeous and you did a wonderful job on the tutorial. I will certainly give this a try. Great tutorial. I don't have the ncessary items to actually try it out, but it looks easy. And fun! Joanne, your work on the Romanian Point Lace is absolutely gorgeous. I don't even know how to crochet, so I probably won't be making any, but I sure enjoy yours! Your tutorial is amazing and easy to follow. Love the details and the wonderful pictures. Sigh. The last thing I need is another handwork project but I can't resist this one. You make it look so easy!!! 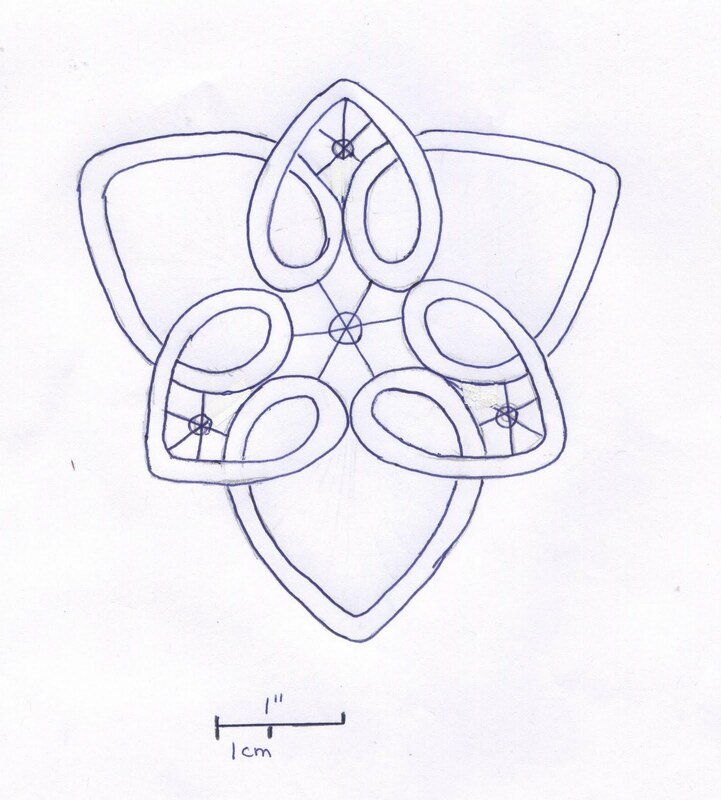 Actually the needlework you did in the open areas looks very similar to Hardanger stitching I have done in the past. Thank you for sharing this great tutorial. This is amazing ..... many thanks for sharing! I used to do a lot of filet crochet, but have never heard of this style. Your tutorial has been ear-marked as I would love to try it out one day. Great tutorial. I was prompted to learn from a project in Anna too but couldn't understand their instructions for the cord, even though I'd been a crocheter for 30+ years. Borrowed a video from IOLI and it got me through those frist few stitches which are the tricky part. The rest is easy. I'm going to put a link to this tutorial on my lace blog. I have made up a few patterns too, which I guess I should put on that same blog. Soon, hopefully. Have a great trip! Superb model. I know recently the romanian lace. I'll talk to my blog. Thank you and congratulations. Thank you so much for this lovely, lovely tutorial. I love it. I know how to crochet since I was 7 years old . But to me this is a new technique. Honestly, the motive is gorgeous and your explanations are very clear (though English is not my mother language. I'm French, I'm an English teacher, but I never read crochet or knitting explanations when they're in English). The last thing I needed was another needlework project, but this is just too sweet and juicy to pass up! I've looked at lace making before, but always admired and moved on because of the learning curve. I feel like I could sit down and start this today. Great tutorial - very clear and thorough! Joanne, thank you so much for posting such a detailed tutorial with the closeup pictures. I keep coming back to other needle work besides crochet, but haven't been brave enough to attempt it. Maybe I will try this now that I see such a well-written lesson. Great tutorials! Thanks so much. I've crocheted a big ball of braid, and just printed out the pattern. I'm going to run the paper through my laminator, and then, on to the fun! I saw another online tutorial for making the braid, and I would still be sitting here puzzled if I tried to use it, so again, thanks! Update: this is so much fun. The laminator over paper printout of your pattern worked---no need to use a cloth backer. I did trim it in the same way your picture shows, because the laminated paper is pretty stiff, and hard to manage in 8 1/2 x 11 inch size. Also used a large sharp needle to make holes in the plastic. Thanks again for a neat project! Wonderful Tutorial!! I had not even heard of this RPL. Some of the stitches do remind me of Hardanger too. I will really try to do this technique soon. Thanks for the pattern also. I am a new follower on your blog..
amazing! Your tutorial is so easy to understand. I love your pattern. Wow, this is really a very helpful tutorial... Congratulations on such wonderful piece of work. I had never heard of this before. Saw it on Ravelry and just had to Google it! That's where I found your tutorial. Love love love it. The pics look great. I'm saving it for myself to refer back to. Thanks so much for your time and devotion to this. I first read about RPL in the Nordic Needle newletter and then found your tutorial. I just thought that I'd let you know that I completed my first piece using your instructions and design. I gave it to my sister for her birthday just before Christmas! This is beautiful! My Grandmother taught me to crochet when I was a little girl and by the time I was a teenager I had given it up...that was something 'old' people did. I had 2 back surgeries last year and a lot of free time on my hands! When I crochet all of my problems melt away and I am able to focus on stitches instead of pain. Anyway, I am so excited to start this project! This is beautiful and your instructions are through. Thank you for sharing this. Our EGA group decided to do a Romanian Point Lace project for one of our monthly programs. A friend and I decided to do this lovely ornament as a warm-up to the program. Neither of us had ever done RPL and we needed to see if we would be able to teach it to others. These directions were fabulous and the pictures were very helpful. We even crocheted our own cord. I just finished mine and I am SO PROUD. It turned out beautifully!! Thanks so much for your excellent instruction! Thank you very much for this tutorial. I'm working on my first RPL motif, and stumbled on some questions, but you seem to have answered them all in this tutorial. Thank you! I enjoyed your tutorial so much. My son went to Romania on a mission for our church and served 2 yrs. He brought home a lovely oval table topper to me made in Romanian Point Lace. I know how to crochet and was facinated by it. It was so interesting to see how it was done. Thanks. I did it. And it only took about 3 days (and I have kids), so all you procrastinators should try it! This is absolutely beautiful! Definitly going to try this. I've never heard of this type of needlework. This work is wonderful! I'll try to do. Loved! Thank you for the tutorials on Romanian point lace. I saw another video on youtube, that the instructor had said that your first stitch is over the working thread and the second one is under the working thread. I saw you just went under. Does it really make any difference if you go on top or below the working thread? Also do you have any youtube videos on making some of the stitches of RPL? I couldn't find another way of replying to your question since you are a "no-reply" blogger, hopefully you will see this. Do you mean when making the actual braid? The other person that has videos makes her braid different so that it can be unravelled from either end - I have no desire to do that and I prefer the look of this braid pattern. I don't have videos online for the filling stitches because they are basic stitches that you make to fit in the spaces, and they can really be created any way that appeals to you. If this doesn't answer your question maybe you can email me directly - my email is found on my profile page. Thanks! Thanks so much for your tutorial. Which size tapestry needle do you recommend using? I need to order some, but there are so many sizes to choose from. I am trying this out because it's a gorgeous pattern! Love this! I'm a beginner bobbin lacemaker. I've seen needle lace done, and have been thinking of trying it. Thank you so much for this tutorial. I want to try it! WOW! That looks amazing. Thank you for the tutorial. I'm going shopping this afternoon to get materials and tools. I can't wait to get started :) Cathy McGrath. Thank you very much. it is so generous of you to post this tutorial. I am definitively. going to do it. I am a volunteer in shelters for abuse and vulnerable women and I am trying to teach them to tach them something to increase their income. Thank you so much for your detailed instructions - I have learned so much! It is very generous of you. I particularly love this pattern. It is nice to find something pretty but not floral. Thank you again! Thanks for the tut :). Can't wait to try it :). I use also this braid....have a nice day from Tenerife!!!!! Next, I feel confident enough to try your daffodil RPL-CAL. Thank you very much for these tutorials!! Thank you for posting this. 9 years later...and still a very useful post! I'm 1st generation Romanian in the States. My grandma used to do this when before she emigrated to the US, but has since passed away with all of her culture. Boo. Anyways, I'm trying to familiarize myself with Romanian culture but not many tutorials exist on this topic...still.